Video and dvd projections please click here. Grafics created from film images, click here. I have presented over 60 films publically, but there are many more in my archive. 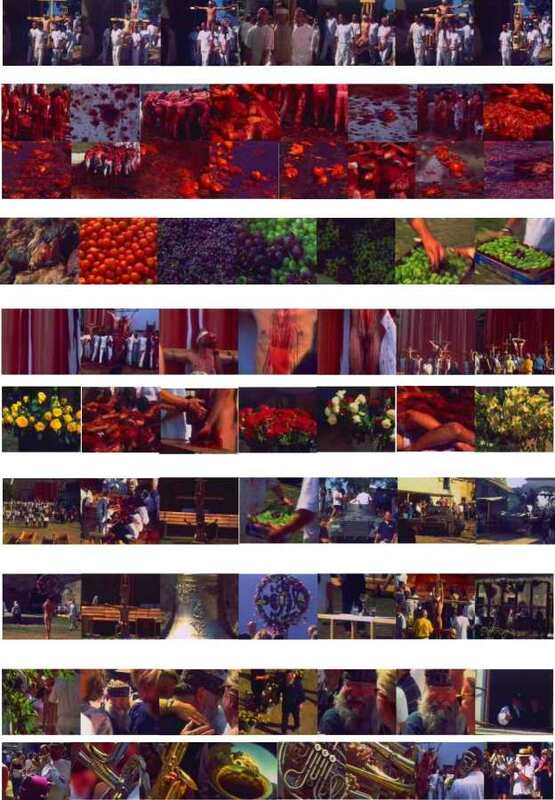 Here are some images taken from 3 of my Super 8 films. Fiona Léus' intense observation of people and a landscape in 'A DAY AT THE SEASIDE', shows a holiday beach during a whole day, from sunrise to sunset, filmed with time lapse. The image itself and the choice of time units deliver a monumental film about about human kind and nature. "Intensiv sind die Beobachtungen von Fiona Léus, die sowohl Landschaft als auch Menschen zeigt. A DAY AT THE SEASIDE behandelt im Zeitraffer einen gesamten Tag an einem Urlaubsstrand in Südengland. Der Bildausschnitt und die Wahl der Zeiteinheiten ergeben einen monumentalen Film zum Thema Natur und Menschheit." Aus GRIP Zeitung, Frühjahr 1993. 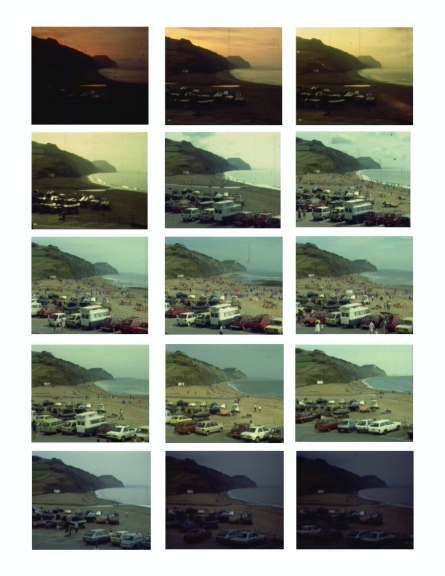 "A day at the seaside, Charmouth, August 1987"
Super 8 Film, Colour, 13 minutes. C-Print - 80cm x 60cm - available as a limited edition. 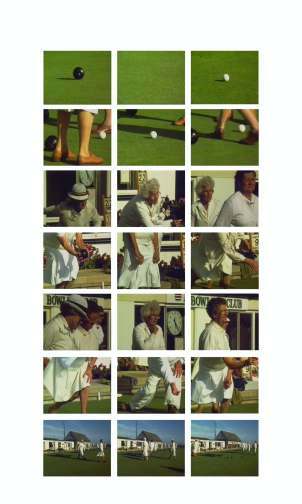 Filmed at the Lyme Regis Bowling Club, Dorset, England. The film makes use of time lapse and slow-motion, observing facial expressions and how players move, showing details of the accepted fashion for ladies who play, the perfection of the lawns and ritual movements in playing out the game. Stille Beobachtungen ältere Damen in weiß gekleidet, speielen auf makellosen grünen Rasen 'Bowls'. Filmed at Prinzendorf, Austria, during the 6 Day Play, by Hermann Nitsch. I followed the last 3 Days of this Gesamtkunstwerk with my camara. The film is a very subjective, painterly view of parts of the play. C-Print - 100cm x 70cm - available as a limited edition.